Ben voilà. J'ai croisé sur un marché de mon petit village du sud de la France un "Marchand de cailloux" qui m'a donné le virus. Et c'est parti. Adolescent, les premières sorties dans des anciennes mines où il n'y avait rien à trouver, ou presque ; et puis : Duranus et Cap-Garonne. Et le virus ne m'a jamais quitté. Je l'ai mis en veilleuse, d'autres passions l'ayant parfois étouffé (la musique surtout) mais il reste toujours bien vivant, bien présent : 30 ans qu'il me hante pour mon plus grand bonheur : Très bonne maladie !!! Here I am. I met, on a market, in the little town in south of France where I was born, a Crazy guy who was selling stones. and he gave me his disease. 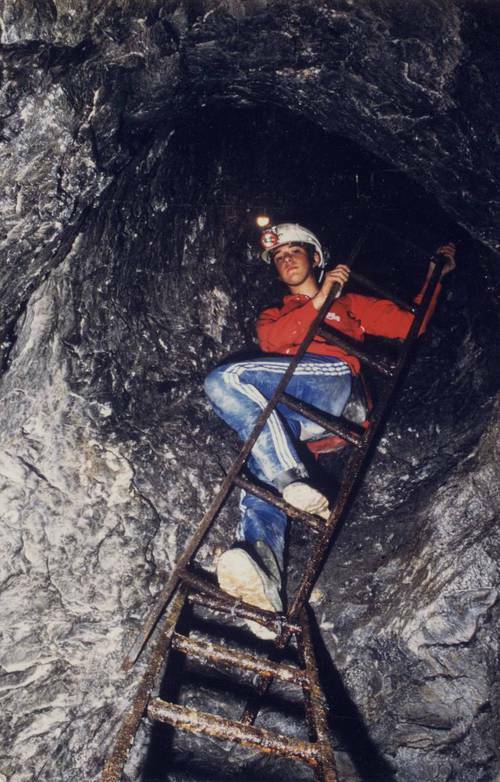 As a teenager I first visited ancient mines... where there was almost nothing to find. But I quickly discovered Duranus, and Cap-Garonne (still my main interest). This disease never left me. I did other things, got other deseases (especially music) but this main one remains still alive and comes back again and again... for my greatest joy. 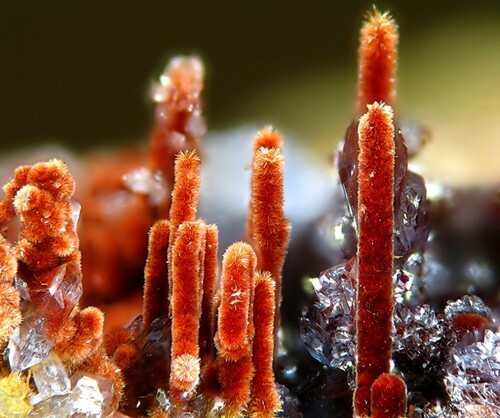 This page lists Pascal's favourite minerals, localities and photos. All lists in alphabetical order. 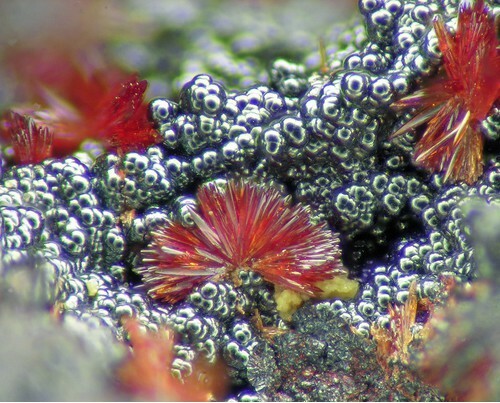 Miargyrite crystal cluster in a quartz vug. The yellow crust is frequent but its nature is undetermined. 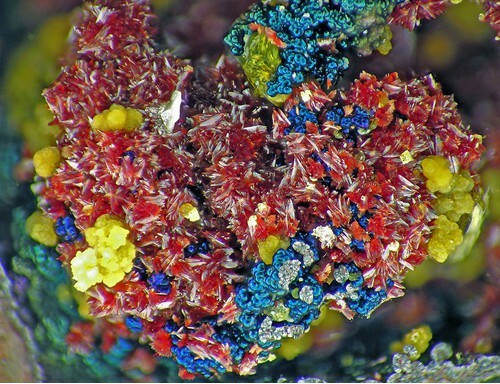 A ridiculously colorful specimen, consisting of brilliant, transparent crystals of bright red Carminite, associated with yellow Beudantite, iridescent blue botryoidal Goethite, and a single thin white Cerussite crystal. This specimen was challenging to photograph, primarily for two reasons. First, there is a wide range between the brightest and darkest elements of the image, and second, the colors of this piece are both highly contrasting and highly saturated. To offset the reflectivity of the specimen, this photograph was taken under reduced light, and that light was further controlled with two layers of diffusing media. Even with this technique, the difference in image brightness between the brighter elements, such as the Cerussite crystal, and the darker elements of the image, posed a challenge to both the camera and the image processing software. The field of view is 5 mm. Ex: Hans Börner collection. Robert Meyer specimen and photograph. 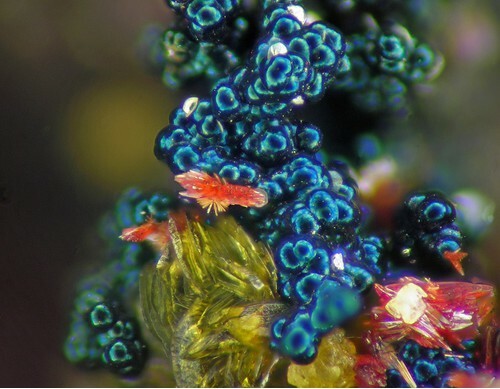 An odd, lobster-shaped aggregate of red Carminite crystals with bladed-habit golden-yellow Beudantite crystals on iridescent blue balls of Goethite studded with tiny butterfly-shaped groups of white Cerussite crystals. The field of view is 0.4 mm. Ex: Hans Börner collection. Robert Meyer specimen and photograph. 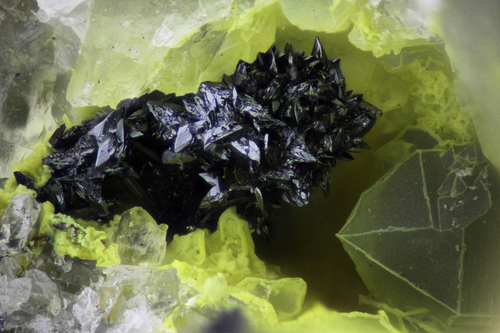 A radiating fan of terminated red Carminite crystals, 0.35 mm across, on botryoidal black Goethite, with minor yellow Beudantite. Ex: Hans Börner collection. Robert Meyer specimen and photograph. Pascal Chollet does not currently have any sponsored pages.